Except . . . it wasn’t. A few years ago my friend Carol Park and I were walking through such a meadow, and I pointed out the paintbrush. Carol was tactful. “Um,” she said, “the stuff we called Indian paintbrush in Colorado was a lot different.” I clung to my heritage. Surely it was a case of different plants in different places ending up with the same colloquial name. When we got back to the house I pulled out my trusty Stan Tekiela. Ulp. Gram was full of beans. What we have here is Orange Hawkweed. Quickly I flipped to the page for Cowslips. Thank goodness Gram was right about those. My whole childhood was in danger of Deep Questioning. So here, in honor of all the things that went right in my childhood, is a post featuring orange hawkweed and interesting trees and Mr. Potato Head and water. The slideshow should have loaded by now. Afterward I’ll have a request. The request: There is a certain way that light slants through the waves on Grand Traverse Bay. It illuminates the water from inside, and shows the shape of it and the movement and the sand beneath—I’ve never been able to capture it in a photo, although I’ve tried and tried. I see that I’m not doing a very good job capturing it in words, either, and I’m generally better at that! Anyway, if any of you wonderful photographers and painters who visit here periodically have a notion of what I mean, and if you’ve managed to capture it, please let me know. I’d like to see that. I expect it might be the same at the seashore as it is on the Great Lakes. Betty Beeby’s been working on the same notion for years now, and she still hasn’t got it right to her satisfaction. It isn’t as easy as it might sound. It isn’t easy at all. Oh! I almost forgot. Some of you might be wondering what muckle deed yins are. I refer you to Fee’s comment in the previous post, another in her fine series of Scottish Lessons for the English-speaking. Gerry, that’s the problem with common names. Orange hawkweed IS (sometimes) called Indian paintbrush in our part of the country, but “Indian paintbrush,” Western variety, is something entirely different. You mean Gram was right? Oh bliss oh joy! It is a colloquialism. I am utterly colloquial. Thank you Gerry. Have a wee Brucie bonus (that’s an old game show reference). Mony a mickle maks a muckle, ye ken. (Many a little thing makes a big thing, you know) We do like a wee tongue twister now and again. Smarty. I have been at a Genealogical Society meeting and my head is spinning from all that the lady from Clan Ferguson had to say. I am going to practice my Scottish and surprise her. Mony a mickle . . . What?!?!? It’s not Indian Paintbrush? I’ve always called it that, too – it may have even been my gramma that told me that, too. I know exactly what you mean about trying to capture that aspect of our beautiful waters. This is the trouble with the delay between when you comment and I get it and approve it. Ah well. Now PJ’s comment is approved up there, and we can both plainly see that our grammas were right after all. PJ says so. That’s good enough for me! I’m a bit dissapointed my grandma didn’t teach me bout Indian Paintbrush. She must have taught me something else – I liked her company much. It will be like catching time in a moment – if you know what I mean. I’ll bet your grandma taught you a lot of things–and now you have a chance to pass them on! I would be very interested to see a photo that catches time in a moment, light in a wave. The light in the waves lives in the motion. Stop the motion and most of the sparkling light fades. But I think there is a reminiscence left here. I think I know what you are talking about as far as the light on the waves, Gerry. I’ve been searching my archives since you posted this looking to see if I could find anything similar to what you are talking about in my photos at the seashore. This is the closest I’ve found so far, although I’m sure it is not exactly what you are trying to describe. I will keep looking. Thank you, Karma. 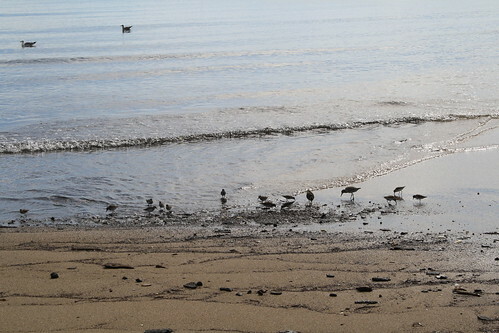 I like the photo with the seabirds, yet it is not what I am thinking of. What is in my vision is a wave that you can see through and into–as if you were holding it up like a piece of beachglass. I have to keep working on the description I think. I know what you mean, Gerry, in capturing the waves with the light filtering and bouncing from beneath highlighting the bottom up. How to do that and what light conditions entail this type of capture, I don’t know. Yes, the light bouncing up–that’s important. Glad you enjoyed Mr. Potato Head. I thought he was an engaging fellow! Gerry, I have to pay more attention to the waves the next time, all I ever saw was waves crashing into shore. Once you start watching the light in the waves you’ll be hooked.